In Part 3 of the continuing book review, the selected areas in Africa discussed generally do no present good legal conditions for climate change compensation and litigation law suits. Neither South Africa nor Israel have common liability so the amount of the compensation may not be as high as other jurisdictions. However Israel offers some nicer conditions for victims because corporations are required to take due care. Egypt does not have material increase in risk. The likelihood in Kenya to win such a case is also low. „Climate Change Liability – Transnational Law and Practive“, edited by Richard Lord, Silke Goldberg, Lavanya Rajamani and Jutta Brunée, Cambridge University Press, Cambridge 2012, ISBN 978-1-107-67366-3. 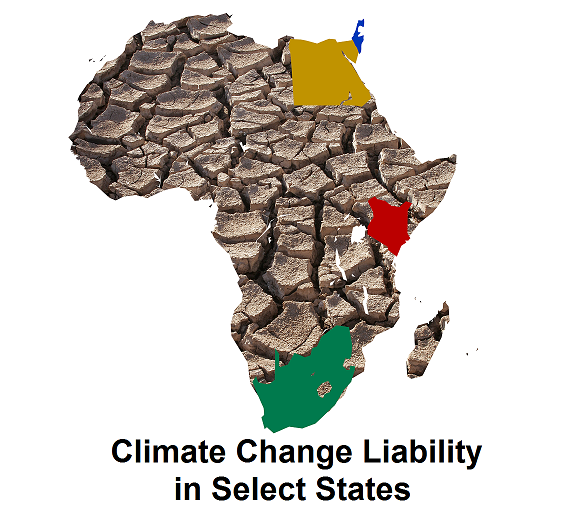 This book was published at the end of 2011, right in time for the Durban summit, and to our knowledge, this is the first book comparing the law of different national systems under the aspect of climate change liability, the major topic of this blog. It has been written by more than 40 authors and is of good average quality. Accordingly, we present the content of this book quite in detail. When doing so, we focus on one of the two types of liability: private liability (discarding public liability). We summarize the various contributions in a view of indicating the chances of victims of climate change to sue successfully polluters. For some of the states examined in the book, our summary is very short, regardless of the length of the original text. The first blog entry focused on the general conclusions the authors draw from the detailed investigation. The second blog entry presented the chapters on Australia, China, India, Indonesia and Japan. This blog entry presents the legal situation for Egypt, Israel, Kenya and South Africa. Liability on a fault basis: To obtain compensation via Article 163 of the Egyptian Civil Code (ECC), the claimant has to establish fault, a fault being “a breach of a legal obligation to observe due care towards others, by deviating from the behavior of the reasonable man” (261). In the view of the authors, emitting greenhouse gas (GHG) can hardly be regarded as a fault given that the environmental law does not forbid it and given that Egypt is a non-Annex I country (262). Liability on a non-fault basis: Article 178 of the Egyptian Civil Code establishes the responsibility of the guardian of things which require special care (262). The guardian may prove that the damage has occurred as a result of an alien reason to which he did not contribute (262). The major obstacle identified by the authors in the case of climate change litigation is the fact that “it is difficult to prove that the defendant is primarily responsible for the long-term harm that is caused by many contributors around the world” (263). “Egyptian law does not recognize the concept of 'material increase in risk' or a similar concept” to prove a damage; the damage must be there (263). Clean Air Act 2008: GHG fall under the CAA (274). “The CAA prohibits” any natural or legal person “from causing strong or unreasonable air pollution” (274). The damage must have been foreseeable (see below under negligence). Negligence: There must have been a duty of care between the particular defendant and the particular plaintiff (289). The causality is established on the basis of the “sine qua non test” or by assuming that the defendant set a “sufficient cause”; the Supreme Court seems to be creative when wishing to compensate victims (291) which may include assuming causality based just on statistical grounds (292, 293). The damage must have been foreseeable which implies that the defendant could see the potential causality between his behavior and the damage; and that he also should have seen this causality (290). The authors assume that there would not be a joint and common liability of tortfeasors in the case of GHG emissions, but just a compensation based on the individual tortfeasor's share (e.g. market share). Nuisance: Nuisance covers the “interference of one person with another person's enjoyment of his/her land and is therefore too narrow in scope” for covering GHG emissions (286). Comment: Israel is attractive for cases where a company infringed the CAA. Israel’s jurisprudence on negligence is also quite generous for victims. But the absence of a joint and common liability of all tortfeasors makes Israel much less attractive in general terms. The authors only describe the legal basis for legal action, without really applying the legal basis to the case of climate change compensation claims. Nuisance: The claimant must prove that there is a continuous interference of the defendant with the claimant's use or enjoyment of land. Furthermore, the must demonstrate that the defendants behaviors was unreasonable (313). if this breach has caused the damage of the plaintiff (314). Causality can only be assumed “if the defendant's particular acts or omissions were the cause of the loss or damage sustained”; this is likely to be difficult to prove (315). The defendant must have acted in awareness of the potential damage = with dolus (337) or, at least, negligently (338). The authors claim that dolus indirectus or dolus eventualis might be given for most defendants in the case of climate change (339). The causality chain shall not be too remote (341). Product liability: The authors claim that the Consumer Protection Act, establishing a strict liability, could in theory be invoked for climate change compensation claims caused by goods, whether produced in South-Africa or imported (342, 343). However, here again the issues of wrongfulness and of causation arise (342). Nuisance: Nuisance can be given by “an act or omission that inconveniences another's right of use and enjoyment” and that constitutes an unreasonable and wrongful use of property (343). Joint and common liability: The South-African law provides for the apportionment of damages in accordance with the Apportionment of Damages Act (340). Thus there is no joint and common liability. Comment: Though providing for a variety of relatively promising legal paths for climate damage litigation, the South-African law is not ideal for victims of climate change due to the apportionment of damages (no joint and common liability). Lawyers might nonetheless appreciate reading this chapter in as much as it is sophisticated. Several argumentations such as the one on dolus (instead of mere negligence) are unique and make this chapter particularly instructive. The litigation issue here is surely going to be a long and tedious battle for the courts involved. This is a good case for the estate lawyers in toronto to study on.